The Deep Sea Fishermen’s Union, Washington Sea Grant and the Port of Seattle Fishermen’s Terminal are co-sponsoring a Coast Guard Approved First Aid at Sea Course on Monday, February 20, 2019 at Nordby Conference Room, Nordby Bldg, Fishermen’s Terminal in Seattle. Topics covered include CPR, patient assessment, hypothermia, cold water, near drowning, shock, trauma, burns, fractures, choking, immobilization, First Aid kits and more. This upcoming meeting will be a real nail-bitter as the U.S. and Canada struggle to come to terms about the management of the Halibut resource where the parties struggle to reach an agreement in this time of decreasing halibut abundance. 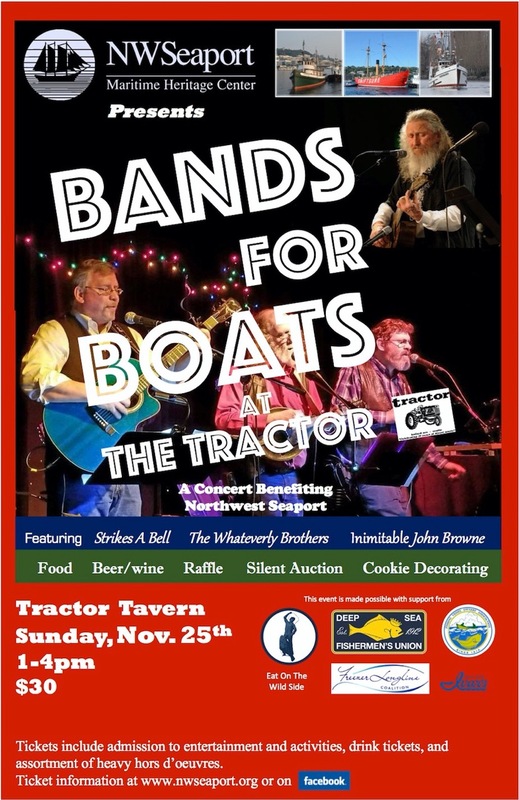 Come to the famous Tractor Tavern at 1pm on November 25th to enjoy great music, food and drink, and fun activities to support Northwest Seaport, a local non-profit preserving Seattle’s largest and most historic museum ships. Bands For Boats at the Tractor will feature live music, heavy hors d’oeuvres, games, raffle prizes, a silent auction, and more. Tickets are $30 each and are available online by clicking here or going to www.nwseaport.org. Tickets include admission, a free NWS tote bag, and two tickets for beer or wine. The bar will be open as well. Proceeds from the event benefit Northwest Seaport, a registered 501(c)3 non-profit. Since 1964, Northwest Seaport has striven to preserve and interpret our region’s largest surviving historic ships to serve as icons of the Northwest and education platforms for our community that can teach regional history, the physical sciences, marine trades, creativity, innovation, and community service. This event is co-presented by Northwest Seaport, Eat On The Wild Side, The Freezer Longline Coalition, Deep Sea Fishermen’s Union, and Fishing Vessel Owner’s Association. Topics covered include CPR, patient assessment, hypothermia, cold water, near-drowning, shock, trauma, burns, fractures, choking, immobilization, and key contents for a complete First Aid kits. When: Friday, Feb. 16, 2018 8 a.m. to 5 p.m.
To register, download Registration Form. For more information, contact WSG Continuing Education Coordinator Sarah Fisken, 206-543-1225 or email sfisken@uw.edu. When: Monday, Feb. 5, 2018 8 a.m. to 5 p.m.
TTo register, download Registration Form. For more information, contact WSG Continuing Education Coordinator Sarah Fisken, 206-543-1225 or email. sfisken@uw.edu. Washington Sea Grant and the Port of Seattle Fishermen’s Terminal are co-sponsoring a Coast Guard-approved First Aid at Sea Course on Friday, Monday, Feb. 13. When: Monday, Feb. 5, 2017 8 a.m. to 5 p.m.